Technical details for the $6.65 Liliuokalani Gardens envelope were released in mid February. The envelope is sold in a pack of five. The Northern Cardinal No. 10 stamped envelope was issued Nov. 3, 2016, according to the United States Postal Service. It is sold in packs of 12. 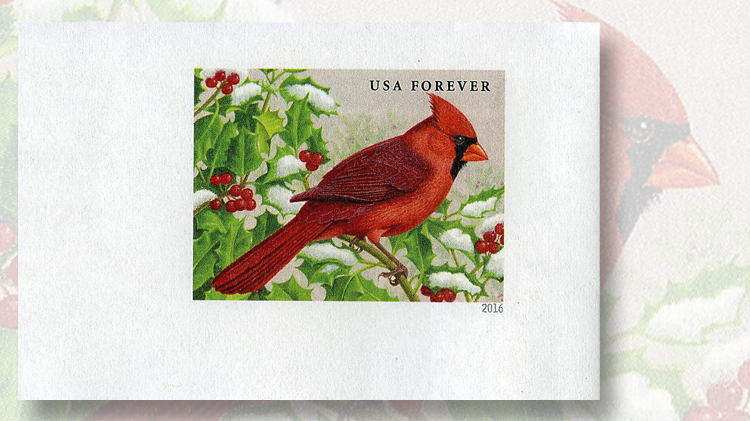 After initially posting that the nondenominated (49¢) Northern Cardinal forever stamped envelope was issued this year on Jan. 8, the USPS Postal Service now identifies the issue date as Nov. 3, 2016. The Jan. 8 date first appeared at the end of January on the USPS stamp retail site, but was revised soon after. Technical details for the envelope, which is sold only in a pack of 12 with matching closure stickers for $9.95, were published in the Feb. 16 Postal Bulletin, a Postal Service publication that appears every other Thursday. Those published details repeat the Nov. 3, 2016, issue date, but provide no option for collectors to obtain a first-day cancel. John Kurtz contacted Scott catalog new-issue editor Martin J. Frankevicz in early January to report that he discovered the envelopes on display in an Ohio post office and bought one pack. Linn’s first reported the existence of the unannounced envelope online Jan. 4. Unannounced cardinal forever envelope sold in Ohio: A new forever stamped envelope with a Northern Cardinal design was sold in Ohio in late December. It is sold in a pack of 12 with matching labels. According to Kurtz, a customer service operator at USPS Stamp Fulfillment Services told him the envelopes were not yet issued. Linn’s followed up with a call to Stamp Fulfillment Services on Jan. 4, and was told the envelopes were then available for purchase. The envelope stamp design by Robert Giusti shows a male Northern cardinal facing right while perched on a snow-covered branch of European holly with red berries. The envelope is offset-printed by USPS contractor Ashton Potter. Technical details are below. Also below are technical details are provided for the $6.65 Liliuokalani Gardens Priority Mail flat-rate stamped envelope issued Jan. 22. Information about the envelope was published in the same Feb. 16 Postal Bulletin, also without first-day cancel ordering options. The Postal Service does offer its own first-day cover for the envelope, at $7.09, as item 232716. The $6.65 envelope is sold by the Postal Service in a pack of five as item 232705. The Liliuokalani Gardens stamped envelope is printed by the independent folding carton company Bell Inc., of Sioux Falls, S.D. Both envelopes repeat stamp designs. The Northern Cardinal forever stamp was issued Aug. 4, 2016, as part of a set of four Songbirds in Snow stamps (Scott 5128). The $6.65 Liliuokalani Gardens Priority Mail stamp was issued Jan. 22, the same day as the envelope. FIRST DAY— Nov. 3, 2016; city— none announced. DESIGN: artist— Robert Giusti, Bridgewater, Conn.; designer, typographer and art director— Derry Noyes, U.S. Postal Service; modeler— Joseph Sheeran. PRINTING: process— offset; printer and processor— Ashton Potter, Williamsville, N.Y.; press— Halm Jet EM4000; folding machine— W&D No. 527 paper— No. 61 Postal Envelope, Type III, block tagging; inks— cyan, magenta, yellow, black, Pantone Matching System 339 green; format— No. 10 regular security with self-adhesive flap; size— 1.6 inches by 1.174 inches (image area); 9.5 inches by 4.125 inches (overall); quantity— 240,000; other markings— “©USPS 2016,” Forestry Stewardship Council logo, “This envelope is recyclable and made with 30% post-consumer content,” recycling logo; USPS item No. — 882105 (pack of 12). FIRST DAY— Jan. 22, 2017; city— Kansas City, Mo. DESIGN: artist— Dan Cosgrove, Chicago, Ill.; designer, typographer and art director— Greg Breeding, U.S. Postal Service. PRINTING: process— flexography; printer— Bell Inc, Sioux Falls, S.D. ; press— Stevens; paper— 12-point clay-coated newsback; inks— cyan, magenta, yellow, black, Pantone Matching System 294 blue, PMS 485 red, varnish; format— regular issue with self-adhesive flap; size— 1.59375 inches by 1.25 inches (image area); 9.5 inches by 12.5 inches (overall); quantity— 648,000; other markings— “This envelope is made from post-consumer waste. Please recycle — again.” recycling logo, promotion text and instructions, USPS logo; USPS item No. — 232705 (pack of five).